It irks me that many Retailers do not fully describe their clothing in terms of dress length, back length, trouser length, or state the height of the model wearing the item of clothing (to enable the customer to make a quick comparison judgement on what the item may look like on them). Without this vital information they are really ignoring both petite and tall customers, and that means loss of sales. I poured over countless retailers to gather information for this blog post. 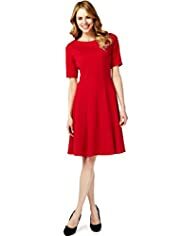 I was looking for clothing to fit a tall woman and in a range of plus sizes. It was frustrating at times to find interesting items of clothing but have access to only incomplete information about the full body measurements of the garments. Retailers get your product information updated please!!! How many times have you ordered a product to only discover that it is not long enough (in my case no information on back length is my major bug bearer) and you then have the bother of posting it back….even worse if you have to pay for the return postage!! If you are like me I am sure you hesitate to buy from that retailer again. Come on retailers take note – by not stating the vital stats of your clothes you are losing potential sales. I have put together a few summer looks for the Tall lady and am glad to say that retailers such as Evans, SimplyBe, Long Tall Sally, Curvety, and Marisota have some very on trend key pieces for your Tall Summer Story in 2013. It may surprise you just what is out there for the tall and tall plus size lady. Other retailers take note. Tall girls can never have enough choice. Help us chose you the next time we shop. Tell us more about your clothes and offer a range proportioned for 5’9" and taller. Being tall has many advantages. I am 5’9" tall and it is the one thing about my own body that I would not want to change. I am happy being tall. Tall girls can break lines with ease because we do not have to worry about cutting ourselves short! We do not need to elongate our presence any further. What easier way to break a line than by wearing different coloured shoes from the colour of our hem or trouser line. We can add interest to and vary the look of our separates by wearing different and co-ordinating patterns and prints, and the narrow frame tall lady (in particular) can pull off horizontal stripes with ease. Without further ado here are my recommendations for your Tall Summer Story. Wear this skirt with the white collarless denim jacket below (body length 23"). Jacket from Long Tall Sally. I think that the red wedge sandals from Evans, with the 7cm lower heel, are a great on trend find to complement this look and to wear with a few other looks I have detailed below. This look can be worked in a number of variations .e.g. the trousers can be worn with the white shirt and either the red wedge sandals or the black patent court shoes (both looks with black patent clutch bag). Clothing items from Long Tall Sally. Red Wedge shoes from Evans. leg lengths 34". 36", 38"
The other look is to wear the black trousers with the black lace jacket and the red leather trimmed cowl neck top. This look is more formal and therefore needs the black patent courts and clutch to set the look off. Trousers, top and black patent court shoes from Long Tall Sally. Lace jacket from Evans, and black patent clutch from Debenhams. I love this textured spot dress from Long Tall Sally and recommend wearing this with the red wedge sandals from Evans. Dress above and shoes below available from Long Tall Sally. Clutch bag from Debenhams. Here are a few key items for your suitcase. Swimsuit from Long Tall Sally, Shorts and Tee Shirts from Simply Be. I love these tee shirts from Simply Be and I think that they are good value. They also come in a navy and white combination as well. I am definitely buying these for my own holidays to Paris in August along with the shorts featured (I’m buying the white). In the summer evening what better way to stroll along the promenade and shimmer in the evening sun with this purple dress from Marisota and the silver flat sandals from M&S. Break your line and wear with red heels from Cinderella Shoes, and statement bracelet from Madeleine Fashion. Black peg leg trousers, by New Look, great value at only £14.99. Wear with smart top and jacket below. You can pull off this look with low heels or flats (for all day comfort). I have chosen 2 looks with these white skinny jeans – casual (approx cost of complete look £61, AND smart (approx cost of complete look £62.00). I adore this peplum top from New Look with the diamond stone effect embellishment around the neck line. and to dance the night away I have chosen these silver court shoes from isme to complement the finish of the neckline on the peplum top. Look 3 – Barn Dance! These boot cut jeans from Long Tall Sally are a complete find in that they go up to a 38" inside leg length in a wide range of sizes up to size 24.
and your cowgirl ankle boots! I hope you enjoy your selection of trouser looks for long legs. The tee shirt top from isme, and the peplum top from New Look can also be worn with the boot cut jeans from Long Tall Sally. 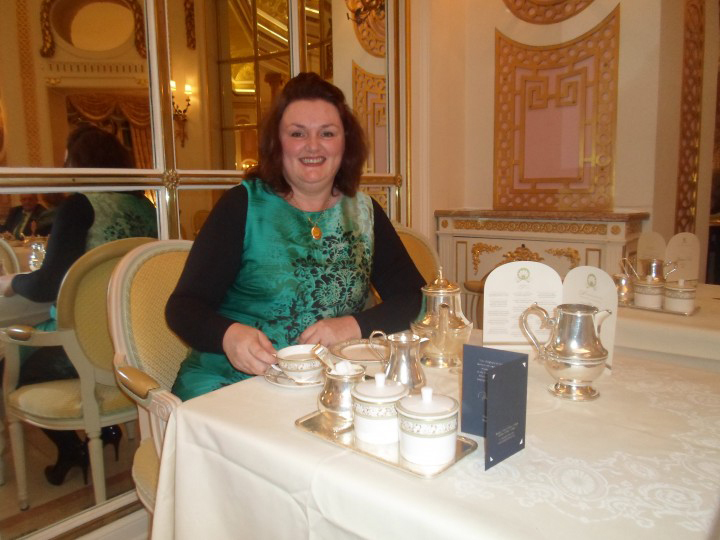 I had the great pleasure of having Tea at the Ritz (London) recently. This was a truly wonderful and sumptuous occasion. The food, the ambiance and the surroundings were magnificent. It was magical to partake in one of the most elegant of British traditions – having Afternoon Tea (and at one of the world’s oldest and finest hotels). The dress code at the Ritz for women is modest elegance. The Ritz is not the place to display cleavages, bare backs, tattoos, and bare legs. Designer labels, however, are not necessary to get the dress code right! Have a look at my recommendations below. I have selected my favourite dresses, shoes and bags to put together your Afternoon look. Expert Design firm support dress available from Daxon £49.00 (up to size 32). I particularly like this dress due to the added support, and the fact that the shape scales down well in proportion to also suit the petite lady. The Raspberry patterned shade is also a fresh summer look. DOUBLE CLICK ON EACH PICTURE TO BUY ITEMS. I hope to feature my ‘as recommended by Diane’ on the site each week. I am an online customer of our websites so I have a good knowledge of the Merchants and their product offer (I am 5’9’’ tall and a UK 18). I am inviting Merchants to supply me with clothing, shoes, accessories etc. and I will review and talk about them on the site each week. Even within standard sizing many women have above a standard size in bra size, leg length, shoe size, calf width etc. The High Street often does not cater specifically for these needs. In the blog I hope to bring you products that are beyond and above standard sizing. Even if you do not perceive that you are a typical plus size customer, you may have an above standard size feature of your body that you cannot find the correct sizing for in the High Street. I intend to bring you what you need in a one-stop-shop for all clothing, footwear and accessories etc. Please follow me on Twitter and tell me what you think. It is only by ‘chatting’ to each other that I can improve the Merchant and product selection offer for my customers. Looking forward to working with you all. In all I thought the dress was good value for money at £31.60 and quite possibly the value find for the summer to take you through formal and semi formal occasions. The only negative comment I would make is that the dress is not lined. When I wore the dress I bought an anti-static half slip. This seemed to work reasonably well but I have since sent my dress to the dressmaker for her to line the skirt (just me being fussy – a good petticoat would suffice). Even if M&S had of charged £50 – £60 for this dress (with a lining) it would still have been great value for money. Big pity about the lining but a great find for the money. I wore the dress on an evening out to Dinner with my husband. The dress is versatile enough to take you to many summer occasions and it is made from a heavier weight viscose blend fabric so is warm for the summer evenings too.